A warm Highland welcome awaits you at my traditional Skye cottage with views over Uig Bay and adajcent croft land noted for its breeding corncrakes. Just one mile from the ferry terminal, Harris Cottage is a convenient stopover for anyone travelling to or from the Western Isles, and is also a good base for a holiday in Skye, allowing you to fit in a day sail to the Western Isles during your stay here. There is plenty to see and do in the Uig area, including the Skye Museum of Island Life at Kilmuir (4 miles), canoeing and windsurfing at Linicro (3 miles), and pony trekking and fishing in Uig itself. 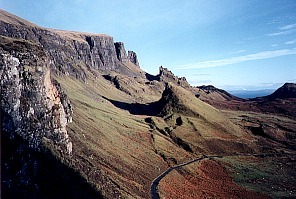 There are many excellent walks in the area, and the famous Quiraing area of rock pinnacles is not far away, the haunt of the ring ousel and the golden eagle. 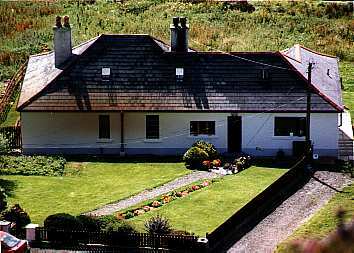 For anyone doing the two-day Trotternish Ridge Walk, Harris Cottage is a good place to stay overnight. For the less energetic, the mystical Fairy Glen is within easy reach, and there are many other secret delights in this part of Skye which I will be happy to share with you. The accommodation consists of double, twin, family and single rooms. If arriving by ferry from the Western Isles (see Calmac website for times), turn left after the filling station and follow the road round until it meets the A855 Uig-Staffin road. There is a sign for "Idrigill" here and you will see Harris Cottage on the right-hand corner. To get to Skye from the mainland, you can cross by the bridge from Kyle of Lochalsh to Kyleakin, or take the Calmac ferry from Mallaig to Armadale, or the summer-only private ferry from Glenelg to Kylerhea. From any of these places, take the road for Portree and then Uig. At the centre of Uig is a road junction: left for Uig Pier, right for Staffin and Kilmuir. Take the right fork. After 3/4 mile you will see a road off to the left signposted "Idrigill". Harris Cottage is on this corner, on the left. You can get Citylink buses to Uig from Inverness, Glasgow, Fort William and Kyle of Lochalsh. Stagecoach run a local bus service connecting Uig to other parts of Skye. Contact Portree Tourist Office (01478-612137) for further details.